The Festive Amazon is the only Amazon species with a red back and rump. Both adults plumage green, the feathers of the neck faintly edged dusty black; wing coverts thinly edged yellow/green; lores and narrow frontal stripe dark red; blue above and behind eyes, sometimes bisecting occiput; blue chin; red lower back and rump; primary coverts violet/blue, edged green; primary feathers violet/blue; tail green. Bill grey/black. Eye ring grey, eye orange. As in adults but duller; green lower back and rump with a few red feathers; some dull red at concealed bases of lateral tail feathers. Eye brown. Call is nasal wah-wah in flight. Also wide variety of calls including screeches. Fruit such as: apple, pear, orange, cactus fruits, pomegranate, etc, forming about 30 percent of the diet; vegetable such as: carrot, celery, green peas and beans, fresh corn, etc; also green leaves of Swiss chard, lettuce, sowthistle, dandelion, chickweed; spray millet; mix of small seeds: canary, millet and smaller amounts of oats, buckwheat, safflower; limited sunflower, soaked, dry or sprouted; cooked beans and pulses and boiled maize, and complete pellet. 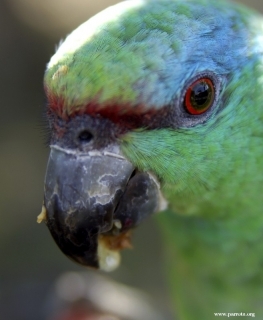 The primary threat to this species is accelerating deforestation in the Amazon basin as land is cleared for agriculture. Also susceptible to trade and hunting. Found in Amazon River drainage from mouth at Ilha do Mixiana, NE Brazil, west to SE Colombia, in Vaupes and Amazonas, E Ecuador, mainly along Ríos Napo and Aguarico and tributaries in Sucumbíos and E Napo, and NE Peru, in Loreto. Found up to 500m (1640 ft) in várzea forest, riparian secondary growth and river islands. Rarely far from water. Found less commonly in gallery woodland or savanna with scattered trees, and plantations. Fruits, seeds, berries, nuts, flowers and leaf buds. Habits poorly known, appears to be resident, with possible movements at extreme ends of range; usually in pairs or small flocks, but with large groups gathering at communal roosts for the night or at a localized food source. Often approachable. Noisy at dusk when coming to roost.